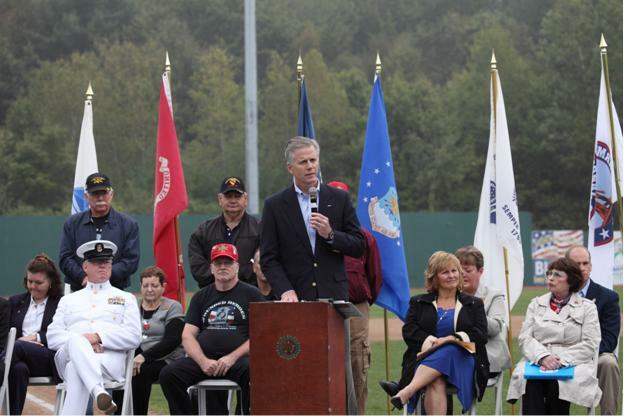 Secretary of State Charlie Summers speaks at the POW/MIA Recognition Weekend in Old Orchard Beach on Saturday morning. Secretary Summers expressed pride for his country and the members of the United States Military saying “In this country we leave no one behind. No matter where you are or how long you’re there, we will come and find you”. The POW/MIA Recognition event was the culmination of a year's worth of planning and an opportunity for members of the community to say thank you to service members and their families for their sacrifices both past and present.